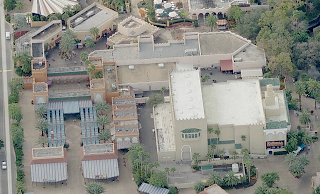 I haven't been doing a lot of large theme parks on Aerial Antics lately, so I figured this was a nice week to take a look-see at Busch Gardens The Dark Continent Africa Tampa. Let's just go with BGT for now. We have to take a pit stop at this building to pay respect to the awesome simulator, Questor, which once resided here. It was removed and replaced by Akbar's Adventure tours, which was a less than worth replacement, and in present day there is no longer any type of simulator at the park. Here's the crazy water section of Rhino Rally, which I made a friend of mine stand in line for to experience because I thought it seemed interesting. It took up a lot of time and I missed out on riding Montu because of it. I'm bitter. 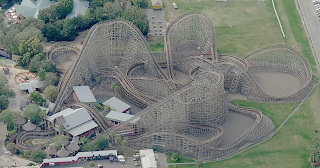 Gwazi consists of two separate tracks, the lion and tiger side. The dueling wooden coasters opened in '99 utilizing some of the land that the Busch brewery used to sit on. This is Land of the Dragons, which is currently under construction to transform into the Sesame Street Safari of Fun. The new area will totally replace the Dragons theme, and use more of that empty space left by the brewery. SheiKra is a visually stunning ride. The B&M vertical drop ride is the older sister of Busch Garden Europe's Griffon coaster. I like how the support footings in the parking lot are painted bright yellow, as if to scream "don't drive into me!" Python operated at the park from 1976 to 2006 when it was removed in order to make more room for the park's new themed area, Jungala. This was Florida's first coaster with inversions, but now the track has probably been melted down and turned into cars... or something. 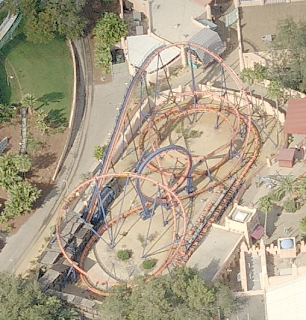 Many people gripe that a lot of B&M coasters are 'forceless.' Here's a prime example of one that is not. 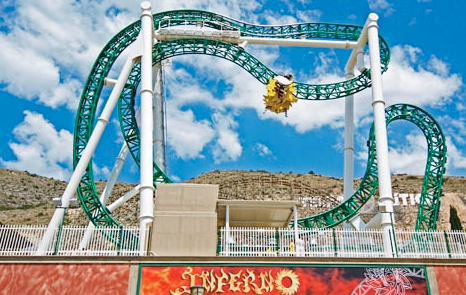 Kumba provides a really wild ride now matter how you cut it. 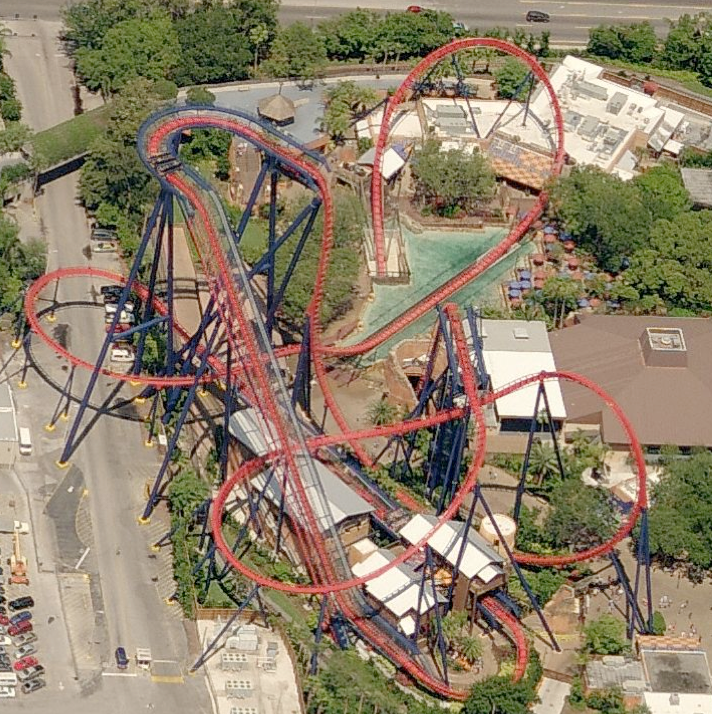 Another member of a slowly dying breed, Scorpion is a Schwarzkopf single loop coaster, of which only a few remain in the world. 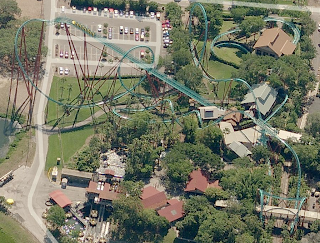 Busch Gardens Tampa has spent the time and money to keep this one in nice shape, which is a wonderful move in my book. 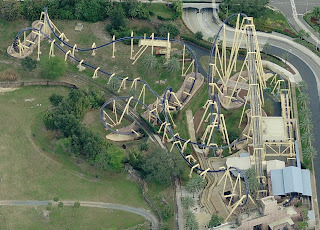 And we'll end with the one I missed out on, Montu. The B&M inverted ride is impressive from the ground, air, and probably even from underground. It's nearly 4,000 ft. long and stands around 150 ft. above the ground below at it's highest point. 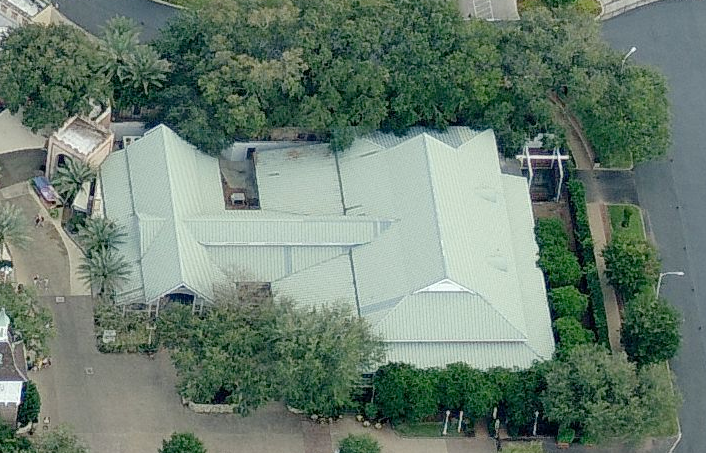 Here's a link to the Bing aerials. 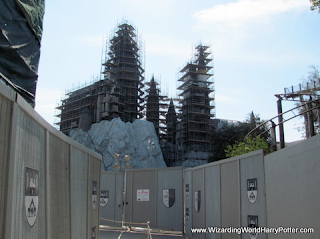 I feel like we've been watching the construction of the Wizarding World of Harry Potter at Universal's Islands of Adventure for years now. Oh wait. We have. Anyway, there are some great new shots posted here that you should check out, like the one above. The forced perspective on that castle is looking pretty nice - I honestly thought it might look a bit gimpy when the art was released but it's turning out so nice. 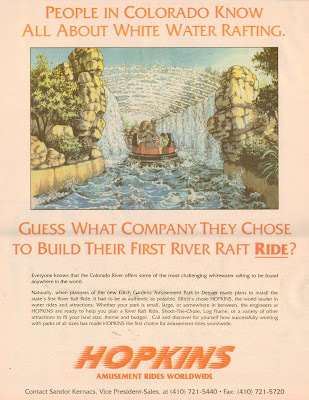 If there is one thing that Hopkins Rides, Inc is known for it's water rides. 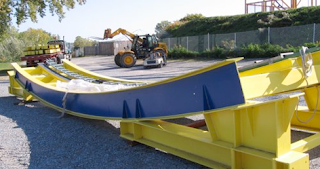 The company has been making flumes, river rapids, and Shoot-The-Chutes for decades now. 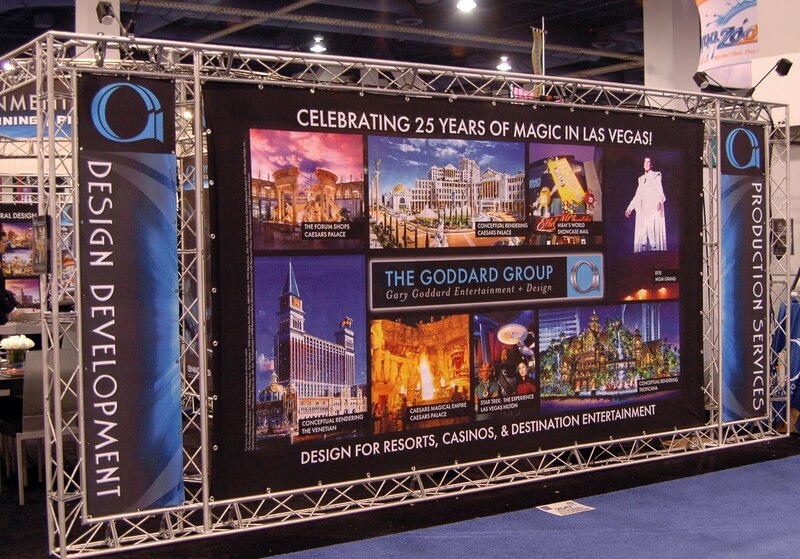 Their attractions can be found around the world in the smallest family parks to the large corporate themers. As this ad makes perfectly clear, Hopkins was proud that the 'new' Elitch Gardens chose them to create their river rafting attraction, eventually named Disaster Canyon. 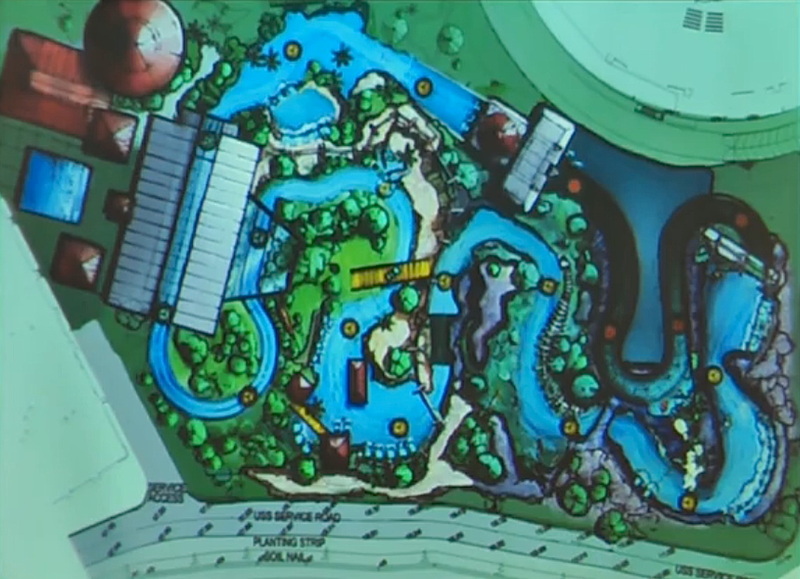 The modern design of the rapids course, along with many special water features like the one in the concept art above, really helped to make the ride stand out in the park's new location. The ride is commonly attributed to Intamin, though all my older materials say it was just Hopkins who did the attraction. Perhaps there was a business relationship at the time between the two. Anyone know? Also take note that Sandor Kernacs is listed at the bottom as VP of Sales, he's now the President of IntaRide, the North American arm of Intamin. The official location of the Shanghai Disneyland project has been announced - the park will be built at the "Chuansha town of Pudong New Area," not that I have any clue where that is. Always nice to see the project creeping forward, though. Though it's not huge news, it always grabs my attention when a new B&M coaster is said to be added... anywhere. This time, something called World Joyland in China is said to be adding a Flying ride with a vertical loop. New design elements from B&M? Interesting. Financially troubled Terra Mitica, located in Spain, has three new possible suitors looking to take over the park. One of the listed companies is - surprise - Parques Reunidos. The theme park has some nice attractions, like Inferno, seen above, but has long struggled is declining attendance and yearly losses. Nut Tree Park in California closed its amusement rides last year, and it looks like their fun little Miler family coaster has been saved and will move to Dixie Landin' Theme Park next year. Always nice when a used coaster gets a new home. If there is one thing Alton Towers is good at it's PR stunts. Now they've gone and hired Simon Cowell's former bodyguard to protect fans from seeing anymore of their new coaster until the park is good and ready. They must have a big marketing budget. Here's some dangerous news for us park nuts that also have a Disney devotion - they've started to sell park merchandise online! Yes, the Disney Store online now offers goodies previously only available at the parks. My bank account better watch out. 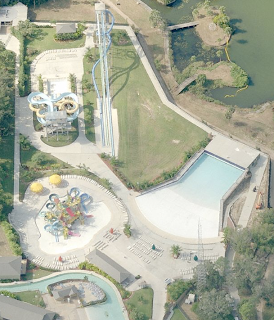 Sea World Australia is going to redo their Arrow Corkscrew coaster with new theming and new Kumbak trains. 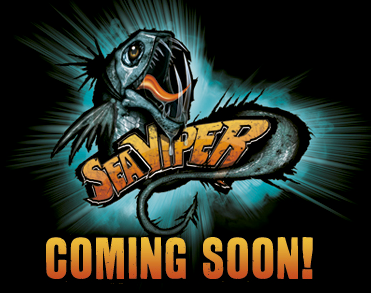 The ride's new name and logo are seen above - and that's one ugly fish! Best of all, it opens this Christmas already! 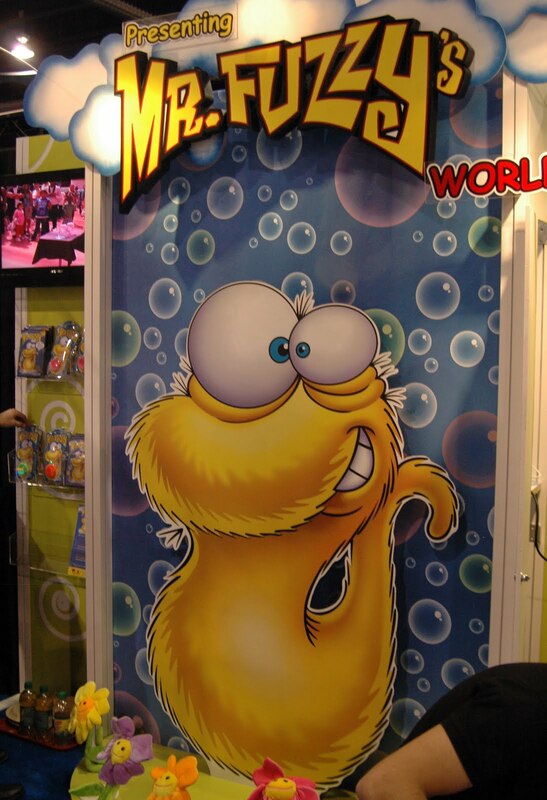 Proslide's TantrumTwist was the winner of this year's Best New Water Park Ride at this year's IAAPA convention. The company has been debuting new slides at a regular pace in recent years, and it looks like they have another winner on their hands. Expect these to pop up at parks everywhere. We reported earlier this week about the Water Cube's transformation into an indoor water park - well ParkWorld has concept art of the designs as well as the official name: Happy Magic Watercube. Too funny! 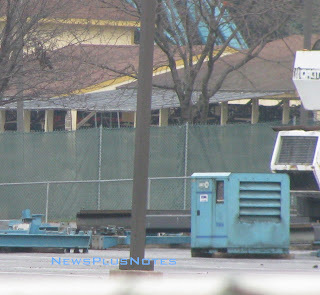 Now that Busch Gardens Williamsburg has reopened for their Christmas Town event, we're able to get a look at the status of the Big Bad Wolf. 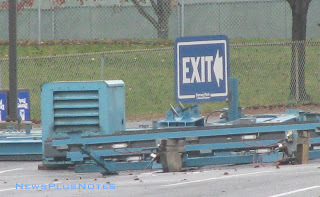 Well, it appears a significant portion of the ride has already been removed, as seen in this gallery from Amusementpics.com. 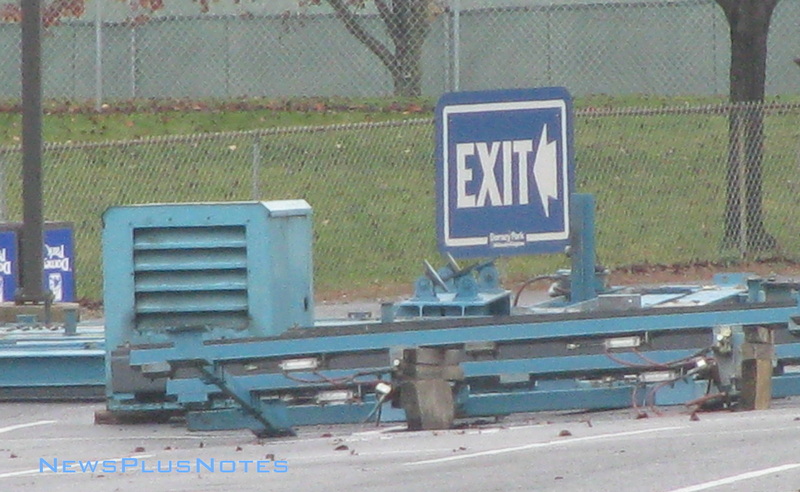 It's always sad to see a coaster standing with large chunks of it removed. It's been a while since I checked in on Holiday's World's construction of Wildebeest, and pow! Just like that, it's pretty much done! How much fun does this water coaster look? I think that this ride looks like more fun than many coasters I come in contact with. I really love how it's perched on the hillside like that, it makes it even more imposing. 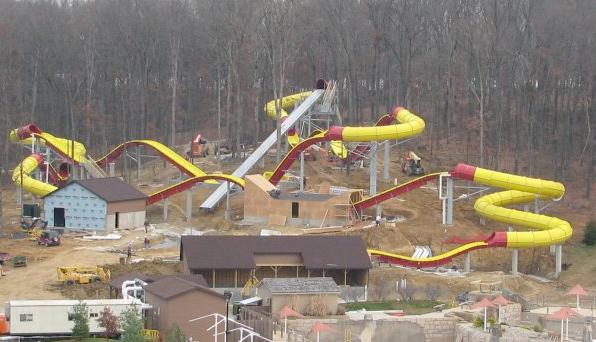 You can see plenty more photos of this new hydromagnetic water coaster on Holiday World's Facebook page. Seabreeze Amusement Park, located in Rochester, NY, has announced the addition of a major thrill ride to the park in 2010. 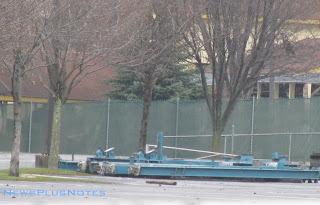 A Zamperla Mega Disk'O will be added at the park near the Whirlwind coaster next year. 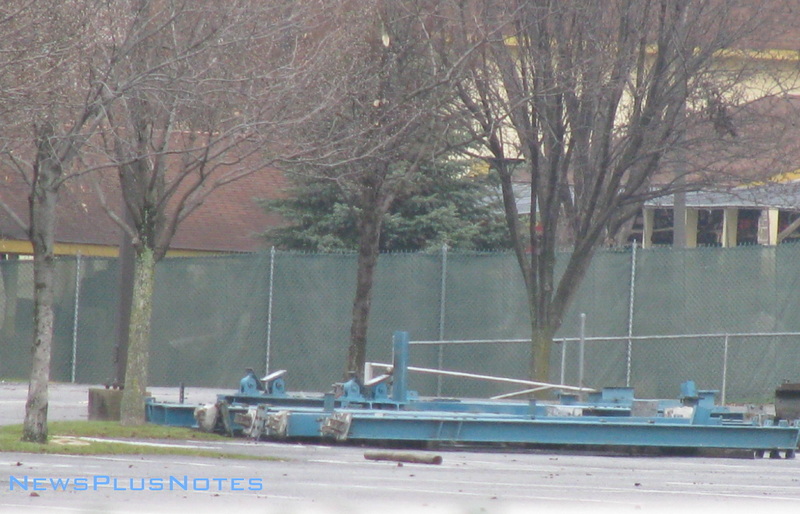 As seen in the photo above, pieces of the ride are already being delivered to the park. The ride will feature a colorful blue, yellow, and orange scheme. After riding one of these at Waldameer this past summer, I can say with certainty that visitors to the park will love it. 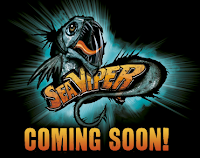 Seabreeze will announce the attraction's name at a later date. More info on the ride, along with photos, can be seen on their website. What a Turkey Day treat! Seems some mysterious ride parts have been delivered to Dorney Park's parking lot, and they bear a striking resemblance in style and color to pieces of Demon Drop from Cedar Point. Here's the first shipment that arrived unloaded in the lot. Take note of the pieces and their color and compare to these photos of Demon Drop at Cedar Point. Here's a close view of some of the pieces, sorry it's a little blurry but I was pushing my camera's zoom capabilities to the max. One last zoomed photo of the big motor looking box... I can't find this in any photos of Demon Drop, but I have limited time right now (must eat turkey). Exciting stuff, no? Is the ride going to be built here? Just stored? Recycled into soda cans? We'll follow this closely on NPN. Stay tuned! I'm so happy that Six Flags Great America swooped in and saved Kiddieland's Little Dipper coaster that I wanted to share their official news release with you all. Moves like this show that a new era of the Six Flags parks has truly dawned. Many, many props to the park for this. Nov. 25, 2009 (Gurnee, Il.) -- Six Flags Great America announced today the purchase of a vintage wooden roller coaster, The Little Dipper. The coaster operated at Kiddieland Amusement Park from 1950 until September of this year when the amusement park closed. The coaster will retain its original name and become the 14th coaster in Six Flags Great America’s impressive line-up of roller coasters. The Little Dipper was designed by Herbert Schmeck and built by the Philadelphia Toboggan Company in 1950. The family-friendly coaster features a three story tall lift hill and is designed as a figure eight track which runs 700 feet in length. It has been honored with the ACE Coaster Classic award by the American Coaster Enthusiasts. Guests can create a season of memories on The Little Dipper with a 2010 Season Pass which is on sale now at sixflags.com for the low price of $64.99. Season Passes include admission to the best water park in the nation, Hurricane Harbor; as well as discount-packed value book with more than $500 dollars worth of offers including four Bring-A-Friend-Free tickets. Six Flags Great America is located between Chicago and Milwaukee and offers fun for the entire family with heart-pounding roller coasters including Raging Bull, a free 15-acre water park, spectacular shows and parades, three children’s themed areas including Wiggles World and meet and greets with Six Flags’ world-famous cast of characters, including Mr. Six." Many months have passed since I last busted on a Six Flags brochure. But with a combination of quick thinking and lightning fast reflexes, I reached for this 2009 beauty from Six Flags Fiesta Texas and successfully managed to stave off the withdrawal. Of course, surely by now I don't need to tell you that it's all in good-natured fun. (Do I?) Come on, this blogger only rags on parks that she likes! More flags. More fun. More Wiggles. Fiesta Texas strutted its family friendly stuff on this brochure cover, which features the brand new Wiggles World children's area that made its debut in 2009. Nevertheless, Dorothy the Dinosaur, Captain Feathersword, Wags the Dog, and Henry the Octopus have broken out their best lederhosen and wiggled their way into the hearts of San Antonians. Poor Henry. Don't anybody tell him that I ordered grilled octopus at a restaurant last week. (They were all out of Yummy Yummy Fruit Salad. What's a girl to do?) It just breaks my heart to hurt goofy, colorfully dressed cartoon characters' feelings. Enough rambling about the name game. 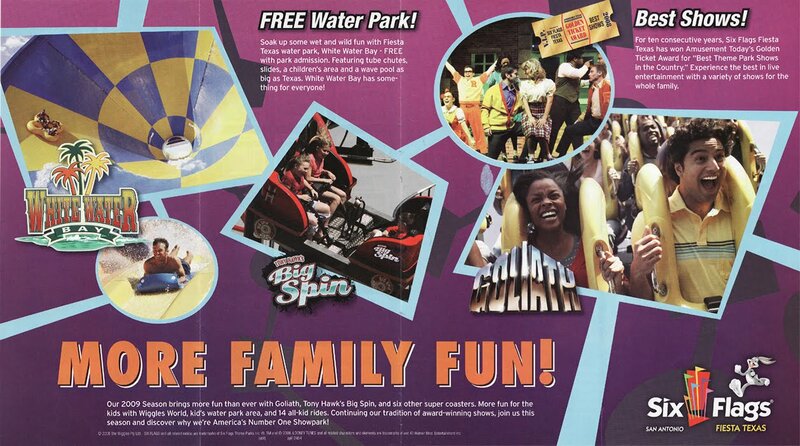 As featured in this spread, Fiesta Texas also sports a water park and some pretty fantastic shows. Although they were finally unseated in the Golden Tickets this year, a 10-year run as the home of the "Best Theme Park Shows in the Country" ain't too shabby. Hmm...All in all, that was a little less "bust-worthy" than usual. Yet as with most Six Flags brochures, I walk away feeling unrequited. So much has been left unsaid! (Not to mention unphotographed, *cough cough* GORGEOUS quarry backdrop and impressive theming *cough*.) Fortunately, in this case, my aforementioned 2009 trip report picks up where this brochure left off. 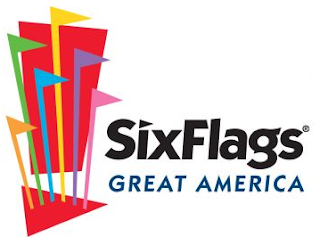 In the spirit of Thanksgiving, let's give thanks that Six Flags has turned itself around and is still able to provide us with the thrills, splashes, and giggles (and wiggles?) found at wonderful parks such as Fiesta Texas. While we're at it, let's give thanks for all the parks we've had the pleasure of visiting this year, as well as the many friends and family members who have shared those experiences with us. I wish all of you in the States the warmest of Thanksgiving holidays! If you watched any of the 2008 Olympics then the building above should look familiar. It's the Water Cube, aka the Beijing National Aquatics Center, the location of the swimming competitions during the games. It's striking exterior made it a visual symbol of the games, perhaps even more so than the Bird's Nest (the main stadium for the games) and became a popular tourist site even after the games ended. Well now the building is closing to be repurposed as a multifunctional aquatic center, part of which will be one of the world's premier indoor water parks. 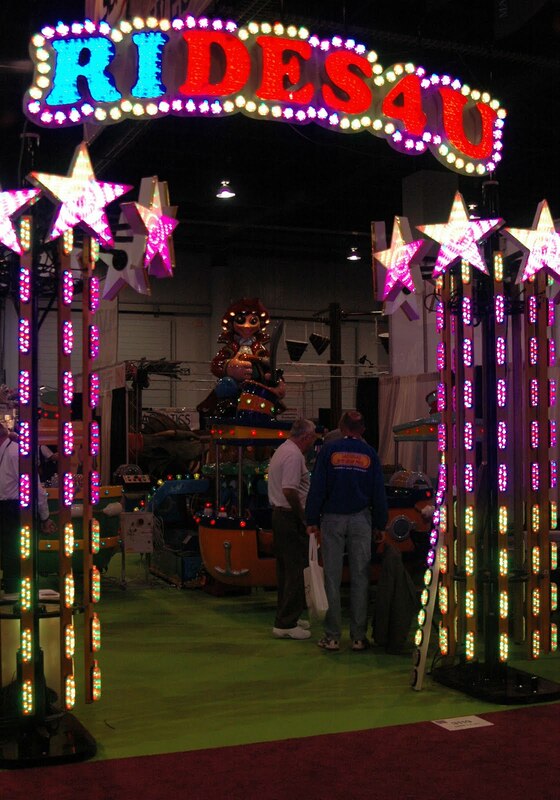 Proslide is supplying the many slides and attractions for the park, some of which are a first for the company. The company's new line of water play structures, RideHouse, will also debut at the new park. Proslide seems ready to take on WhiteWater West's dominance in the water play structure market. The RideHouse combines a play structure with slides, blasters, and tons of other interactive elements. The new Water Cube park will also feature 14 other slides from the company, including a Tornado and Bullet Bowl slide. Today was the auction of Kiddieland amusement park, located in Melrose Park, Illinois, which closed forever this fall after 81 years of operation. In a rather surprising move, at least to me, it seems Six Flags Great America purchased the Little Dipper wooden coaster at the auction for $33,000. The Chicago Tribune is reporting that the parks plans to add the ride in its children's section, possibly as soon as next season. The coaster is a Schmeck design that was built by PTC in 1950. The coaster is only 28 ft. high and 700 ft. long, but it's perfect for a child's first big coaster ride. Hopefully the reporting on this one is good and the ride really has been saved! 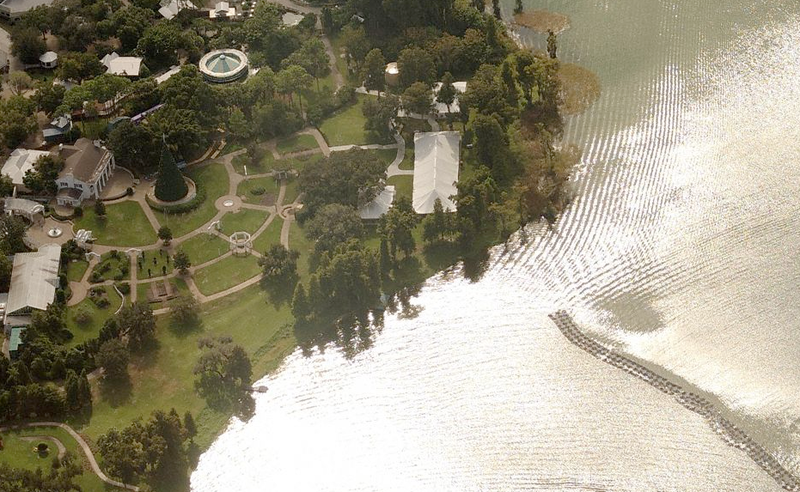 This week's Aerial Antics comes with a bit of sadness, as we take a look at the recently closed Cypress Gardens. The park opened in 1936 and quickly became famous for it's beautiful botanical gardens and it's water ski shows on the lake you can see glistening in the sunlight above. The ownership has changed hands several times over the decades, with many investors and companies such as Busch Gardens owning the property during it's history. 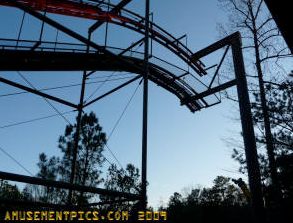 The park was purchased and re-branded Cypress Gardens Adventure Park in 2004, when most of the rides featured in this post were added. The park eventually changed hands again, sold off many of the rides, but still closed. It seems it's having a hard time fitting in the Florida entertainment industry these days. 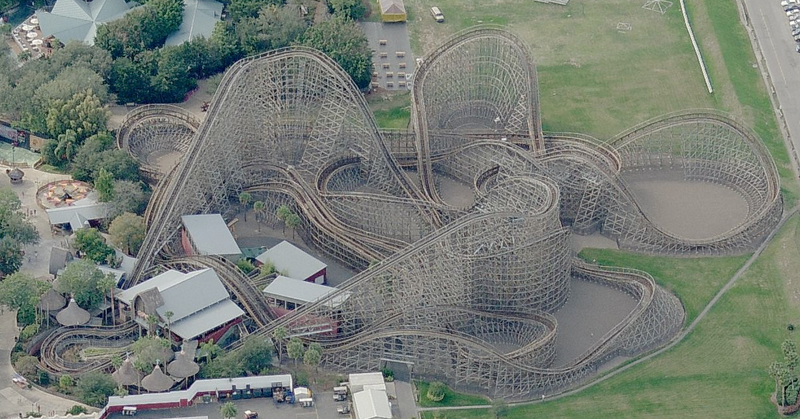 The Triple Hurricane is a family wooden coaster that was named after the three hurricanes that held up the reopening of the park in late 2004. It was built by Martin & Vleminckx, and features a 40 ft. lift and around 1,360 ft. of track. This section of the park was always known for it's beautiful floral displays, and had been dotted with amusement rides during the conversion. 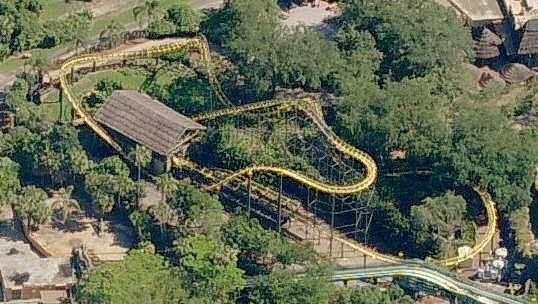 The park was home to two Vekoma coasters, one of which - Swamp Thing - is shown here. 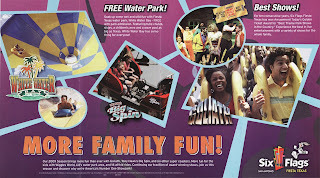 Investments in the park also included a water park, known as Splash Island. Although the amusement rides were sold and removed, the latest owners had tried to operate the water park as a separate admission attraction. It's all new and it'd be nice to see it be able to reopen some day. Finally, a big move for the park was the addition of the Starliner classic wooden coaster. 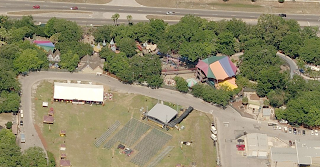 It operated at Miracle Strip amusement park in Panama City, FL, from the 1960s to the mid 2000s when that park closed its doors. Cypress Gardens purchased and moved the ride, carefully rebuilding the John Allen coaster. Probably the biggest tragedy of the park's closure was this ride, as it's not often a park cares to move and rebuild a wooden ride, and this one was only able to operate a little over a year before closing again. For a link to the aerials, click here. 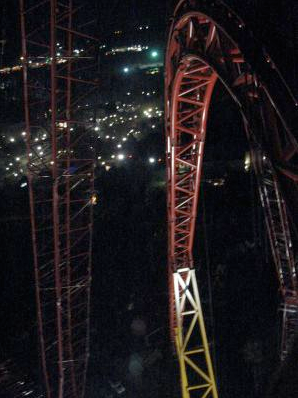 The workers at Kings Dominion stayed up rather late last night to top off their new Intimidator 305 roller coaster. KDFansite was there, and it looks like they stayed to the bitter end. They have a large gallery up that you can check out here of photos from the milestone. I can honestly say that I never expected to see another Millennium Force type coaster again and I'm still very pleased that another now exists! Though not yet officially announced, at least as far as I can tell, it seems Aquatica is planning some new slides for Spring 2010. 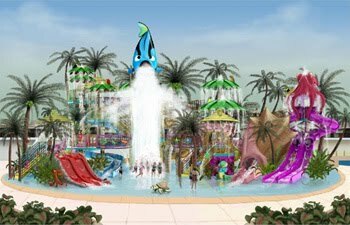 The water park, located next to Sea World Orlando, has been closing the Whanau Way slide tower to work on the new project during weekdays. 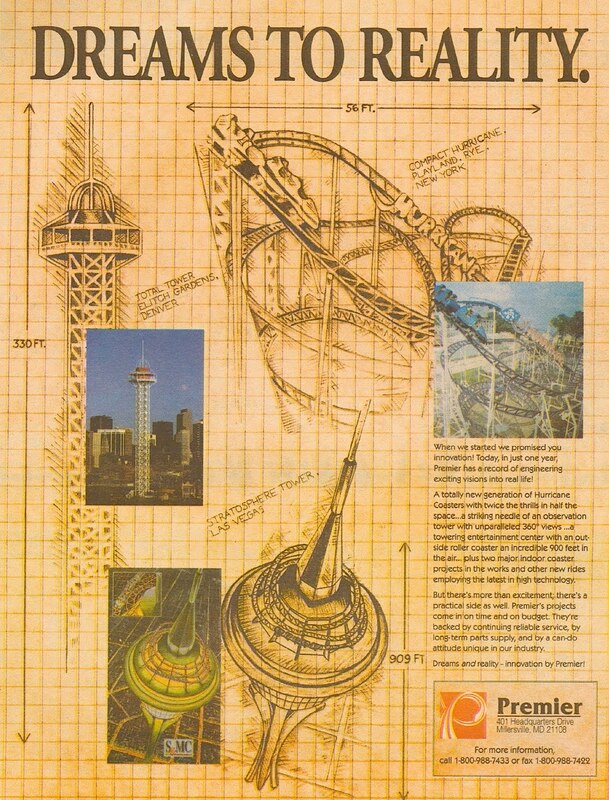 The L.A. Times is reporting that the attractions will be new designs form Proslide. 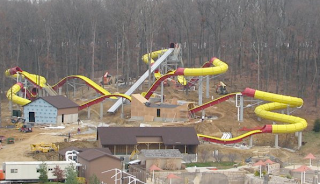 They look to be from the company's new Tantrum line of products, which have mini-Tornado funnels along the slide course. Sea World pretty much leaked the names of the new slides on this press release, noting that the "Omaka Rocka thrills with high-speed tubes and massive half-pipe funnels that will have you sliding frontward and backward and climbing the walls." The Whanau Way slide tower was built with an extra platform level on its structure, so we can only assume these additions have been planned for some time. Check out user IAmASmallAnt's YouTube Channel for a slew of videos of the testing going on at the Jurassic Park Rapids Adventure. There's film of a water test they did on the ride and also plenty of the dinosaur animatronics under test as well. Looking around these interwebs we love so much, I often see sites that feature vintage ads from whatever industry or hobby they are into. 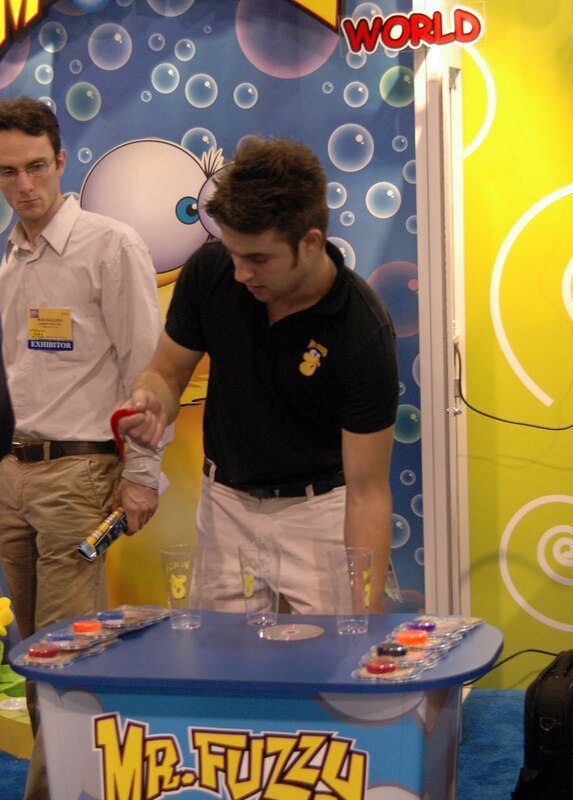 I've also often wondered why no one was doing this for the Amusement industry. So time to step up and give our readers a look back at some ads from our favorite companies through the years. 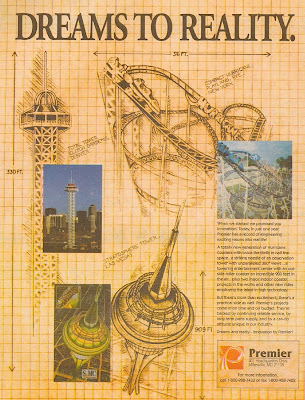 Premier Rides was founded in 1994, but had a pretty limited ride catalogue at that point. That's probably why some of the items featured in this ad are usually attributed to having been designed by other companies. This was just the beginning though, as Premier made a big splash with the debut of their LIM launched rides a short while later, and as a major parts supplier for the industry have been sailing along ever since. 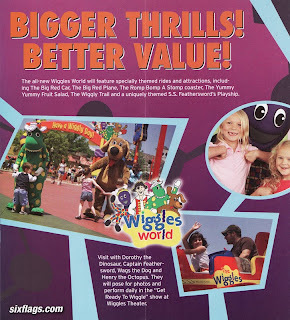 As for this specific ad, it does make mention of two "major indoor coaster projects" that were in the works at the time. 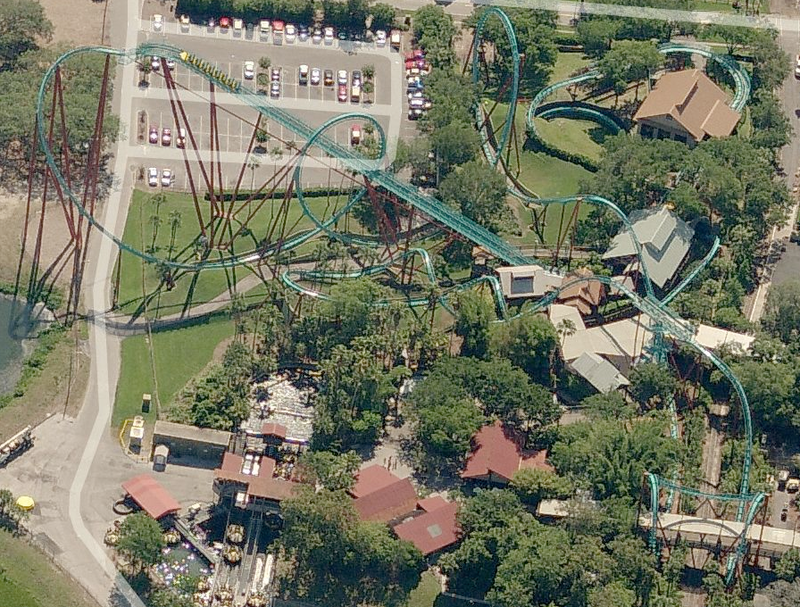 I have to think those are the dark coasters for Six Flags Great Adventure and Six Flags Over Texas, though we know the New Jersey ride eventually was done by Intamin, and the Texas ride was attributed to Premier but has a distinct similarity to the Windstorm coaster once sold by many companies. Interesting stuff, eh? This week brought good news for UK coaster fans. The Dreamland Trust has received a 3.7 million pound grant from the government as part of the 2009 Sea Change program, and they plan to use the money open a new amusement park on the site featuring vintage rides. The centerpiece of this unique park will be Dreamland's own historic Scenic Railway, which will finally be rebuilt after being heavily damaged in a fire set by an arsonist last year. The L.A. Times Funland blog has gotten a hold of some concept artwork for the Big Grizzly Mountain and Mystic Manor rides slated to be built at Hong Kong Disneyland over the next few years. Brady's commentary reveals some great details about the ride experiences as well, including a scene-by-scene tour of Mystic Manor provided by none other than one of the Disney imagineers who worked on it. Members of the Save Libertyland group were shocked and appalled to discover that the city of Memphis ripped out a chunk of the beloved SBNO Zippin Pippin this week as part of their ongoing efforts to clear the site of the shuttered park for future development. It appears there is still more than a little disagreement over who owns the classic 1923 woodie. The city claims they dug into the structure to determine whether the coaster is salvageable, but between you and me, that's a load of horse manure. Relocating a wooden coaster entails replacing the great majority of the wood anyway. What's to "salvage"? End soapbox. The notion has been batted around for several years, but this week Jeju Free International City Development Center has stepped forward and stated that an MGM theme park will indeed open in South Korea in 2013. 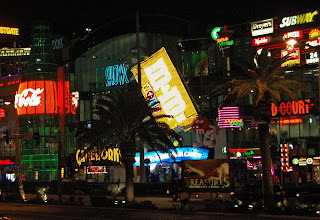 The park, which will be called MGM Hollywood Way, will be controlled by a consortium of as yet unnamed Korean companies, with MGM itself taking a lesser stake. It will be the first MGM park outside the U.S. They're labeled November 2008, but that didn't fool us. 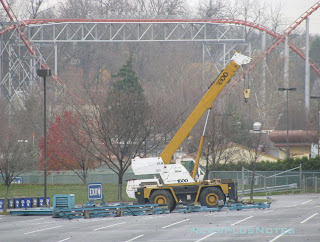 ACE Western PA has posted some new photos of the construction taking place at Kennywood on the former site of the Turnpike. Looks like they're mainly just pushing dirt around right now, but they'll be pushing steel around before you know it! An $800 million movie theme park is coming to Rome, Italy. The first section of Cinecitta World, named after the city's own Cinecitta Entertainment, is scheduled to open in 2011, with the rest of the park opening by 2014. The attractions will be themed to classic titles, including the works of Federico Fellini. While few details are being revealed at this point, it sounds like some of them could be rather...um...interesting. 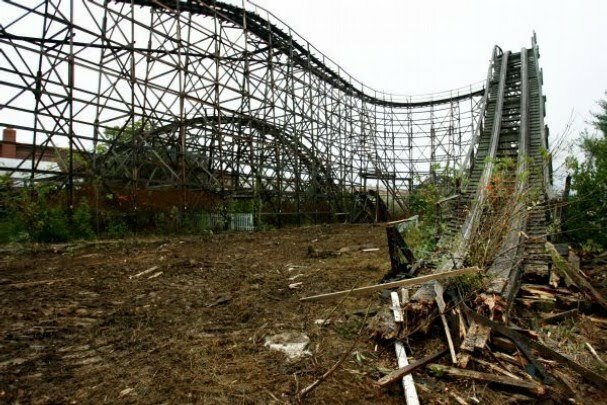 In a move that could be interpreted as the beginning of the end of the Busch theme parks' dominance in the atmosphere department, the company has announced that it is cutting ties with the landscaping company it has used for more than 30 years, effective December 31. Starting in 2010, the Busch parks will maintain their own grounds. More than 250 jobs in Virginia and Florida are expected to be lost as a result, although a Busch spokesperson has stated that the company hopes to hire back many of those individuals. 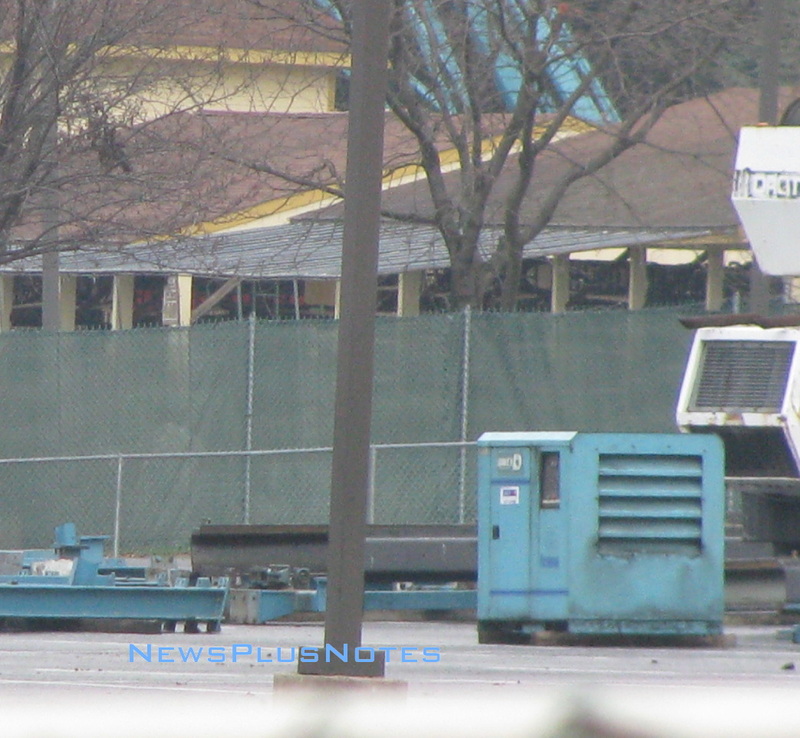 The long discussed but as yet homeless National Roller Coaster Museum (NRCMA) has made up some ground this week. Amusement Today reports that the NRCMA Board has secured a building in Texas which will be used to house part of its distinguished collection of park memorabilia. Just for good measure, the organization has also secured parts of both the Texas Giant (Six Flags Over Texas) and the Big Bad Wolf (Busch Gardens Williamsburg) for the museum's archives. The final sad chapter in Chicago's Kiddieland's history is in the process of being written. Two trains which ran at the park have been sold, and the rest of the rides are scheduled to hit the auction block this Tuesday. Let's hope they find good homes so they can live on elsewhere. 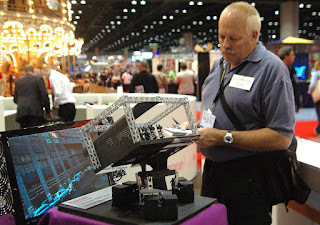 Here are some more news items from the floor of IAAPA. 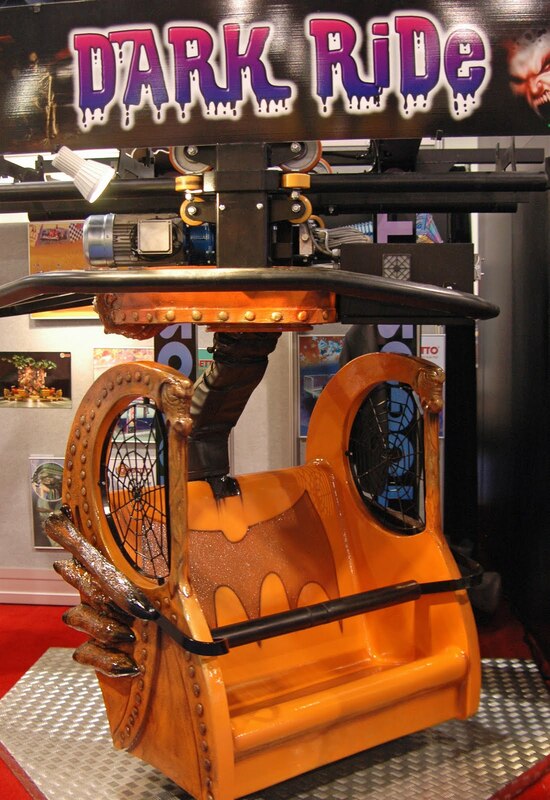 Sally, (http://www.sallycorp.com/,) has introduced a new concept in Dark Rides. Traditionally, the riders do all the shooting at the targets but now you have to look out for the villains can strike back. The story line is you are an energy miner bring solar crystals to Earth while being chased by a notorious band of pirates. When the pirates score a hit, sirens blast, lights flash, and even the cars can spin. With two different endings and the unpredictability of an interactive ride, it will take a while for riders to master this attraction. 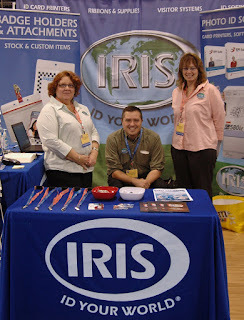 The IRIS companies, (http://www.irsltd.com/,) can provide any type of lanyard, badge holder or badge reel an amusement park requires. 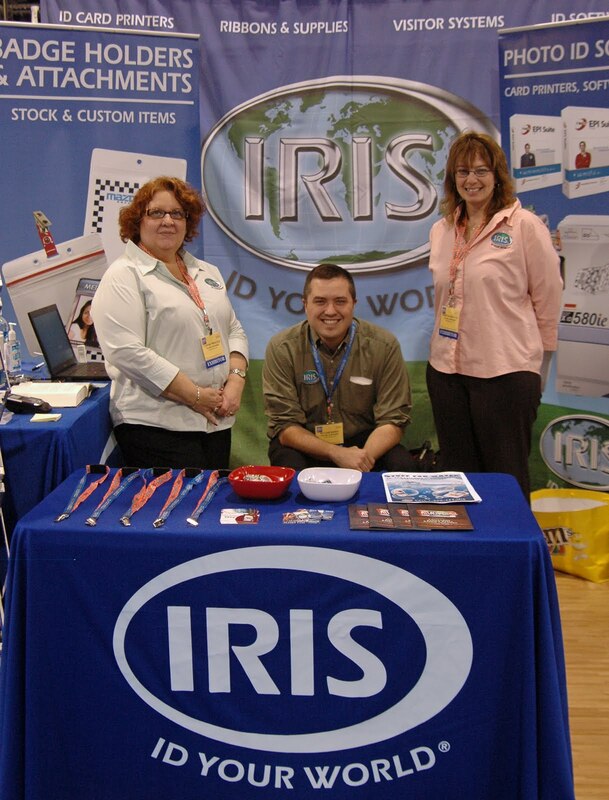 With different options available, personal preferences can be accommodated with only one supplier. Chances are the lanyard accompanying you season pass came from that company. Another interesting dark ride concept is from Gosetta SRL, (http://www.gosetto.com/.) Their portable dark ride features an overhead track and adds an interesting twist where the riders exit the “dark” and find themselves on the second level outside with out anything beneath them. 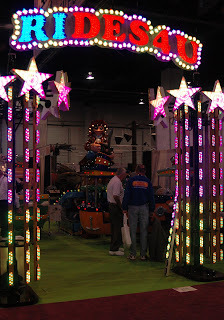 Coming soon to a showman near you, this is a new twist on the portable dark ride. At Maurer Soehne, (http://www.maurer-soehne.de/,) they have designed a non-inverting loop for their spinning coaster. They also announced at new train, but they are still perfecting it at it won’t be on any rides for another season or two. Couples can decide who gets the floorless or floored ride as they get on the train, which should eliminate the discussions outside the entrance to many attractions. 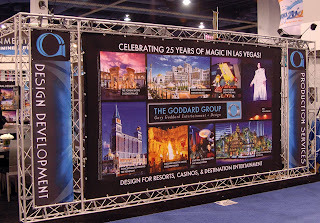 If you walk down the strip, you can see some of Gary Goddard Entertainment’s, (http://www.garygoddard.com/,) work. 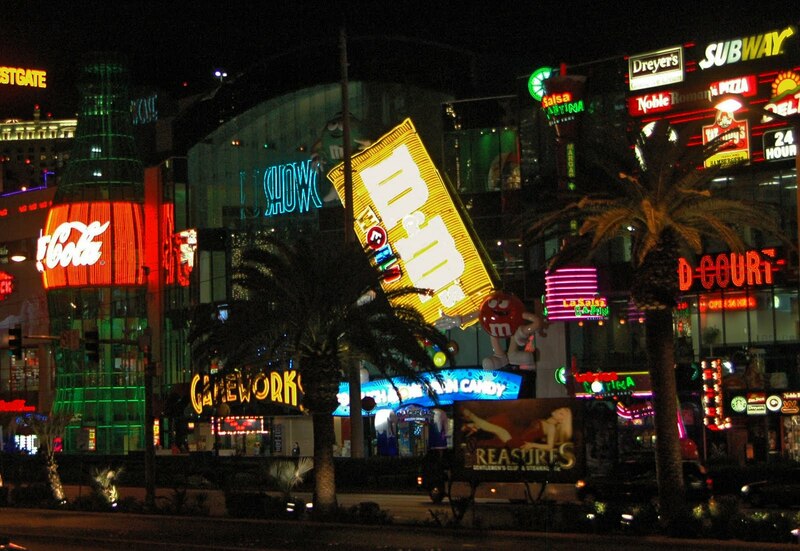 They can theme even a candy store to a level that stands out in Las Vegas, no small feat. The return of Mr. Fuzzy caused a stir on the floor. Many people stood and watched as he did his tricks, and many amusement parks and family entertainment centers appeared interested in adding him to their redemption prized options. Premier Rides, (http://www.premier-rides.com/,) had their roller coaster chain options on display, which it amusing because none of their coasters use them, they are all LIM powered. Here is a shot of the different varieties. 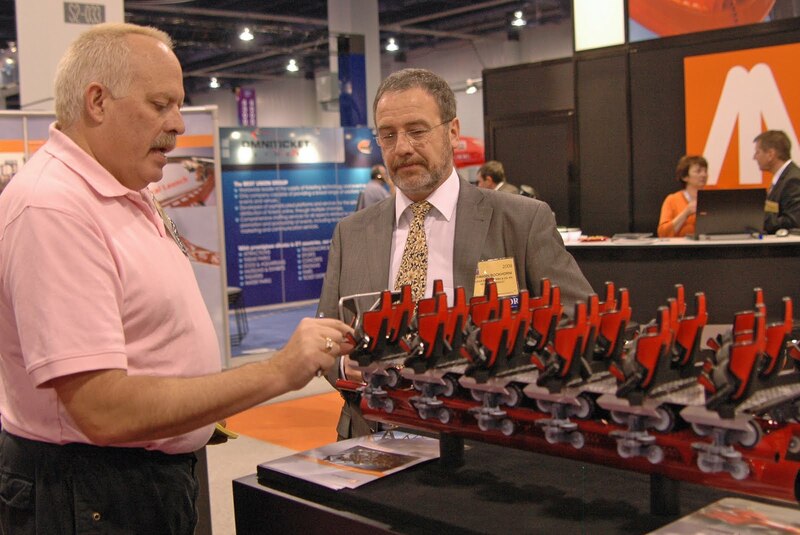 They also displayed their drifting car coaster, which allows the car to pivot in relation to the track. 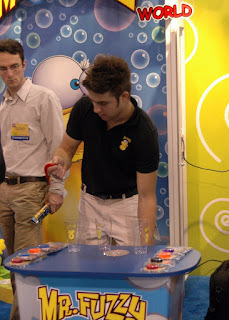 AIMS, (http://www.aimsintl.org/,) held their recertification and other interest meetings in conjunction with IAAPA this year. They are responsible for ensuring guest safety, and by being coincidental with IAAPA, many people who never heard of the organization achieved that vital first contact. A first time exhibitor was Alpine Products, (http://www.alpineprod.com/.) 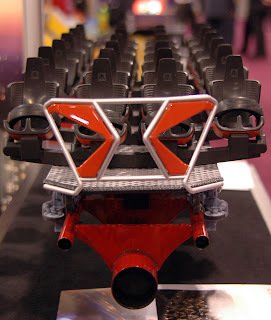 In addition to alpine slide, now they have developed a coaster product that is locked to the track, has on board sensor for an automatic collision avoidance system, and even brake lights to alert a chain of riders. The two riders sit in tandem. Something we are very excited about is the announcement that Six Flags has agreed to launch the first 5D-Attraction in the US as part of the Six Flags 50th Anniversary. More details will be announced later, but Scott can hardly wait. He wanted to fly over to Austria to experience the original. So, that will do it for this IAPPA 2009, we along with the more than 23,000 attendees are breathing a sigh of relief that the marathon has been run!